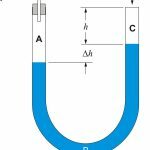 Home / Electronics Articles / How pressure is measured with inclined monometer? How pressure is measured with inclined monometer? The inclined type monometer is an enlarged leg monometer with its measuring leg inclined to the vertical axis by some angle. Due to inclination, scale expands and increases the sensitivity. When P1 and P2 are applied, then liquid rises in the tube. the inclined tube monometer is used to measure very small pressure difference. 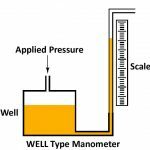 The level of monometric liquid inside the tube is measured from zero level. Here is the distance y that the liquid moves through the tube is greater than the distance x that liquid rises.